Supreme Kourts® proven installation program will provide you with the highest quality constructions available today. We have developed a proprietary program over the past several decades that has proven itself with our numerous successful installations to date. 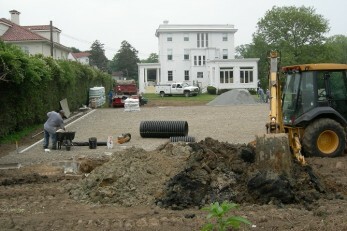 Using the latest in technology plus our unequaled experience, we prepare the site ready for installation. Our team will then install a concrete curb around the exterior of the court, either an above-ground or underground irrigation system. The final step is a generous layer of quality Har-Tru, installed for a stunning, smooth tennis court that will last generations. Har-Tru is 100% environmentally compatible construction for your tennis court surface and a cost-efficient choice. The minimal need for future maintenance makes it affordable and time efficient to have a tennis court that stands up to the toughest players demands. 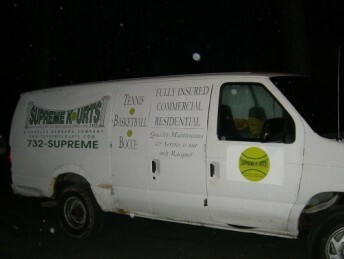 Supreme Kourts® is re-known throughout our tennis court construction industry as the finest builder of clay tennis courts. Our clay court maintenance programs include court resurfacing. Carpet is a tennis term for any removable court covering. A short form of artificial turf weighted with sand is common in Asia. Indoor arenas store rolls of rubber-backed court surfacing and install it temporarily for tennis events, however they are not in use any more for professional events. Carpet is generally a fast surface (more than hard-court), with low bounce. Since 2009 their use has been discontinued on the ATP tour. Indoor wooden courts date back to the dawn of Tennis, today All Weather courts are very common indoors. Slower, higher bouncing rubberized surfaces are used for a cushioned feel. Clay courts too are installed indoors generally with underground watering systems. When tennis began its American introduction, Barnstorming professionals played on canvas laid over wooden basketball courts up to the 1960s. For information about the original indoor tennis and tennis courts see real tennis and history of tennis. Supreme Kourts® constructs a wide variety of All Weather acrylic color-coated tennis and basketball courts, including shock-absorbing cushion surfaces such as Cushion Extreme and Clay Tech; by Lee Tennis. Different speeds of tennis court play can be obtained by altering the desired texture of your tennis court surfaces. Supreme Kourts® provides total tennis court construction including fencing, lighting, windscreen curtains, plus maintenance equipment. Supreme Kourts® turn-key tennis court installation assurance programs reduce both costs and worry over planning problems and job coordination. 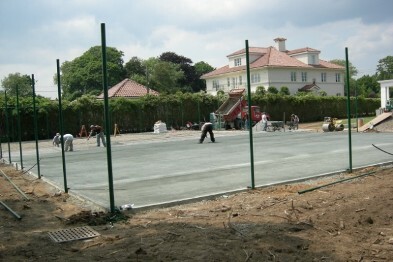 By utilizing the latest technology and developing innovative construction techniques, Supreme Kourts® achieves the highest quality tennis court installations available today. These capabilities are backed by our extensive experience plus our attention to detail customer service in building quality tennis courts for over 7 decades . Supreme Kourts® maintenance program for All Weather includes clearing off all debris and vegetation, installing nets and net posts, fixing cracked on troubled courts with our Rite Way Crack System plus resurfacing (which is recommended every 5-7 years). Adding cushion to your acrylic court will provide consistent bounce, sure footing and outstanding durability. Cushioned surfaces are healthier and respond to body impact and reduce fatigue on player’s legs, knees, ankles and feet. Our bocce and pickleball courts are built with the same precision as our tennis courts. All bocce courts are not the same, our courts are built to last and offer professional and recreational player a quality level of play. We use the proven Har-Tru tennis clay for the perfect surface court. Har-Tru is rapidly becoming the preferred surface among expert bocce players. We also offer synthetic grass over concrete or crushed stone base for less maintenance and year round play. Because bocce courts are built flat and level they tend to hold water after rain storms. Our courts have full drain systems to insure quick play after any rain. Heavy 6" x 6" treated wood edging stays straight, level and does not rot. To complete your court we will custom build ball racks, scoreboards and seating areas. Have your family and friends over for a barbecue, a few drinks and a good game of bocce. All ages can play and everyone will enjoy the prospects of a new memorable family tradition. Supreme Kourts® is dedicated to manufacturing the highest quality All-Weather athletic court surfaces available that are 100% environmentally compatible and dedicated to strict quality control plus sensitive to budgets, schedules and surrounding landscapes. If you have ever looked at a tennis court, it may appear to be a simple piece of asphalt or cement that is painted with lines to create a court for playing tennis. However, the court isn’t always what it seems. When you choose to install a tennis court at your chosen location, Supreme Kourts®’ professionals can show you exactly what a difference a cushioned asphalt tennis court can make to your performance and the durability of the court. When we begin the construction of a cushioned asphalt tennis court, we start by placing a layer of asphalt on the ground, covered by a layer of acrylic. While this would be the end of court construction for some companies, we follow up with the cushioning layers for a better playing surface. In many cases, we will add an additional two layers of cushioning. The bottom layer of cushioning will consist of five to nine applications of rubberized cushioning. Once this layer is complete, we follow up with two to three coats of heavy-grade rubberized granules and then three to six coats of fine-grade granules. We then apply the acrylic paint you see on every tennis court. full-size regulation courts and half courts residential and commercially. Some of our clients include parks, schools, recreation centers, apartment and condominium complexes. With any tennis courts, you can choose from a variety of different colors to match your tastes. Hot mix asphalt spread and compacted with a uniform density and thickness on top of a sub-base. This is probably the most common tennis court in our area. Asphalt, while softer among All Weather, is not crack resistant and occasional undulations do occur. The cushioned asphalt tennis court, which is the same type of court used for the US Open, provides a vast array of benefits to players. The cushioning helps protect the players from injury due to the jarring motion of running or falling. While the cost of the construction of this type of court adds between $5,000 and $11,000 to the cost your court project, you will find the extra cost makes up for not having to resurface your court as often because of the increased durability the cushioning provides. These types of courts are commonly found at public parks, schools, apartments, and private residences. They are most commonly made of asphalt or concrete. All Weather, unlike clay (Har-Tru) courts, can be customized to the customer preferred color(s) and speed. Additional games can be lined on the court surface, such as volleyball, basketball, etc. Both asphalt and concrete type of courts can be tailored to have the same amenities, the only difference is in their core construction. The American Sports Builders Association [ASBA] recommends that an asphalt tennis court is 4+inches of compacted base material and 1.5″ of asphalt, followed by an acrylic color coating system (for non-freeze thaw climates). In freeze thaw climates the compacted base should be 6″+ and the asphalt should be 3″+. Typical concrete courts are 4 inches thick followed by a similar acrylic color coating system. An option to consider for either hard court is a cushioning system. Tennis is played on a rectangular flat surface, usually of grass, clay, concrete (hard court) or a synthetic suspended court. The dimensions of a tennis court are defined and regulated by the International Tennis Federation (ITF) governing body and are written down in the annual 'Rules of Tennis' document. The court is 23.78 meters (78 feet) long, 10.97 meters (36 feet) wide. Its width is 8.23 meters (27 feet) for singles matches and 10.97 meters (36 feet) for doubles matches. The service line is 6.40 meters (21 feet) from the net. Additional clear space around the court is needed in order for players to reach overrun balls for a total of 18.3 meters (60 feet) wide and 36.7 meters (120 feet) long. A net is stretched across the full width of the court, parallel with the baselines, dividing it into two equal ends. The net is 1.07 meters (3 feet 6 inches) high at the posts, and 0.914 meters (3 feet) high in the center. The net posts are 3 feet (0.914 m) outside the doubles court on each side or, for a singles net, 3 feet (0.914 m) outside the singles court on each side. A North/South orientation is generally desirable for outdoor courts to avoid background glare at dawn or dusk. Orientation should also take into consideration other structures and features on the site, such as neighboring property, vehicle and pedestrian traffic, and prevailing winds. Topography of the site and efficient site utilization should be considered as well.